First~ gomen... obviously I broke my word... wasn’t able to post new LJ in this thread. Just a couple of re-posts... was trying to write the continuation of my SS-Up4 but I have a bad headache... I’ll be re-posting the others too next time. Ai: What a bummer, my pen’s not working. Ai: May I borrow a pen? Risa: Sure, it does. I’ve used that one just moments ago. Ai: Really? Here, try writing your number down and see it for yourself. The TakaGaki couple was having a date under a tree. Sitting on the ground while leaning on the tree was the lovely Ai Takahashi. Resting her head on Ai’s lap was the bubbly Risa Niigaki. Taka was happily whistling a random song while Gaki was happily playing with her own two feet, perching the other with the other. Gaki: Aichan! Look! A fruit! Gaki: Quick, climb up the tree to see if it’s already ripe. Taka: *Climbs up and holds it* Yep, I think it’s already ripe. Gaki: Okay. Quick, climb down so that we can start plucking it using this crook. You have a bad headache and you did an update? AI: I think you should go back to your room and rest because you were running in my mind all night. PS: Bending down, the girl in green picked the girl in yellow up and carried her bridal-style. The crowd was loud and was wildly cheering. It was last 10 seconds for the basketball championship with a tie score. Dribbling the ball, Risa Niigaki was aiming for a three point shot when the referee, Ai Takahashi blew the whistle. RISA: But, I did not! Ai Takahashi went to visit her crush Risa Niigaki in her apartment with flowers, balloons, plushie and chocolates in both hands, determined and ready to face her fate When she rang the bell, her jaw dropped on the floor when she saw someone other than Risa opened the door because she knew Risa live all by herself. Her eyes grew wide when she noticed that the girl had no pair of pants on, good thing her shirt was long and loose. Ai stepped inside apprehensive. She was even more shocked when she saw her crush only in her camisole and underpants sitting on a couch holding some things. RISA: Where will you use it? The TakaGaki couple’s inside a fast-food chain sweetly eating and displaying their lovey-dovey affection in public from time to time. Taka would feed Gaki her food and vice versa. Until Taka felt like going to the restroom because of nature’s call. Taka: Gaki, come with me I’m going to the restroom. Gaki: It’s okay, I’ll just wait for you here. Taka: But you must come with me. Gaki: But I don’t feel like peeing. Taka: I know but the sign says “Please, don’t leave your valuables unattended.” So I insist. I definitely dug the valuables one. Risa, hand intertwined with Ai’s, brought her girlfriend into her newly discovered garden of roses near a cascading waterfall with a picnic bag in her other hand. After finding the right spot, Risa laid the picnic blanket on the ground and arranged the bentou she’d prepared for their special date. Ai was speechless [lol] blushing and awestruck by the beautiful scenery and by her girlfriend's thoughtfulness. Risa: Take a seat here. Ai: Thank you for taking me here. Ai: Yes, it is. But you must take me to the dentist after this. Ai: Because you’re too sweet. 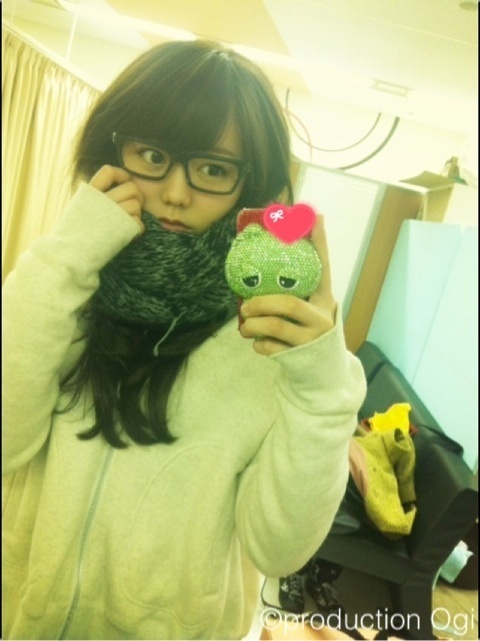 Risa Niigaki, shocked pivoted and ran with a great sense of urgency after reading a new mail on her phone. She had just visited her girlfriend, Ai Takahashi, just moments ago. But no more than a minute after her departure, she received a message which said ‘Help!” from her girlfriend. Opening the door with a little more force applied, Risa exclaimed. RISA: Aichan! What happened?! What’s wrong?! RISA: Eh?! But you were bouncy just moments ago! AI: Haven’t I told you that lately I’m getting my strength from you? RISA: Ah, so that must be the reason. Well, at least, she threw one back at Ai. That last joke was like a one-two combo to the jaw. In a good way, of course. RISA: It’s her! It’s her! POLICE OFFICER: Ma’am, what is your name? POLICE OFFICER: Is it true that you’re stalking her? RISA: Why were you following me? AI: I was just following my mother’s advice. RISA: Eh? You have an accomplice? What did I do to deserve this? POLICE OFFICER: Do you know that stalking is a crime? GAKI: Oh, so you’ll beat your own self up? TAKA: What did I do? Oh man, that's an oldy but goody. Also at the forefront of misunderstandings! Page created in 0.498 seconds with 15 queries.